Get the power of the Jesus-General to help you. Did you guys know that the colour of the crowds is mainly determined by the players' and AI drivers racing colours? For example, a field of red cars will yield mainly red people in the crowd, have dark hueless colours like black, grey and silver? Expect the crowds to be dark and hueless too. Yes, I noticed this a lot. Note that _only_ the players and AI colors selected in driver's menu will affect the crowds - predefined car colors have no effect. Why does this glitch occur? It's not a bug, it's a feature. Nothing you can do about it, I think. What should I do if that happens to me? What do you think, that will happen, when you hit by full speed into piece of hay in reality? Stop by front of car nose in front of it? Nope, you'll press it / fly through, so I think, that it's quite correct (in relation that GR has no movable/pushable/damageable objects). BTW it's influenced by carmaker, who made your car, too - the lower air resistance set in CarEditor and higher overall top speed in moment of impact, the more the car goes ''through'' the hay bale AFAIK. Other option can be bug in X,Y,Z values of the car too. And how can you control the speed with that you can hit the pitmen? I'm not sure, if I understand your question well, but from my observations it's maybe same - cars with low air resistance and in high speed seem to be less stuck by the contact with pit guys too. And on opposite is e.g. default Formula, which has quite high air resistance IIRC. If you put the engine power of a car high enough, the engine sound eventually vanishes (or becomes so high pitched, you can't hear it). Also, if you go fast enough, the car's body vanishes. I discovered this while playing around with car values in the Car Editor (and crashed TrackTool with this). Today I discovered something I haven't seen before in GR, even though it works in 1.05 too (tested). I'm not gonna ruin the surprise - one track can tell more than a thousand words. Join the Joint Effort Tree (JET) project here! It's a known bug, don't remember the details though. It's not a fake, I immediately filmed it with my phone (the replay wasn't showing the car), so I can upload it to youtube or something. Besides, I attached a track file in case you didn't notice, I reckon it should work for anyone else just as it works for me and obviously Areen. It's silly how I never did this before - I was making a track with an office block in top left corner, but I forgot to place the starting positions away from there and.. voila. I did some testing afterwads, and it showed that to which end of the track your starting position is the nearest, to that end of "sky" you'll be clipped to. It's either top, top right, right, bottom right, bottom, etc. So it seems the track borders also divide the sky, making 8 possible impossible starting places. EDIT: here is the video. I wanted to post this since a long time ago but I kept forgetting about it. About a few months ago (probably a few weeks before the release of v1.10), GeneRally was featured on a local PC magazine called PCMedia, and was included in a CD within the magazine itself, with a collection of other free apps and games. The only problem is, on the article they put the old RSC domain of the GeneRally website! Wow, that's good. Indonesia gets a meet with GR, a little publication boost helps alot. But, the proof. Yeah, can you scan the page featuring that game? But duh, they should have insert the correct url, which is the "gene-rally" one, not RSC. I once photographed it with my cellphone. Let's see if I still had it. 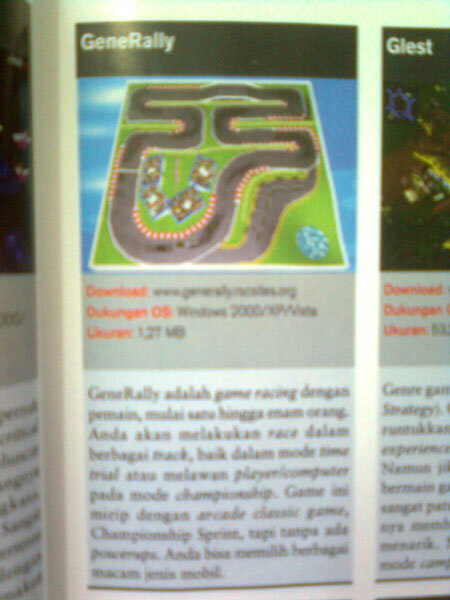 GeneRally is a racing game with up to 6 players. You will race in different racing modes - either in time trial or against other players/computer in a championship mode. It's similar to the arcade game Championship Sprint, but without powerups. You can also pick a variety choices of cars. Last edited by resir014 on Fri Jul 20, 2012 2:04 am, edited 6 times in total. Hehe ;d Actually I see the old url, but I don't know Indonesian xd Could you translate what is excatly in this article? Shouldn't be problem - this old(er) RSC domain stayed in James' hands likely till now and it redirects to the www.gene-rally.com from very website, which ever mentioned GR with its official site. And thumbs up for the zine's editors. Today, I had a race on GR between Michael Schumacher, Ayrton Senna, Nigel Mansell, Andrea de Cesaris, Johnny Herbert and Pedro Chaves with '91 season F1 cars. Guess who won?